Prepare chips (a.k.a baked fries) by heating oven to 350°F. 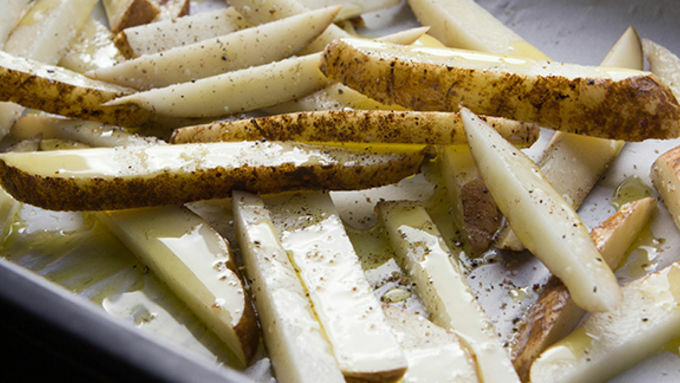 Slice potatoes into wedges and place on a parchment-lined baking sheet. Drizzle with olive oil. Sprinkle with salt and pepper to taste. Place in oven and bake until tender and golden, about 40 minutes. Cut the fish into thin strips, each about 4 to 5 inches long. Prepare batter coating by whisking together flour, baking powder, beer, salt, garlic powder, onion powder, and cayenne. Set aside for 30 minutes. 10 minutes before the chips are done in the oven, heat oil in a tall-sided skillet over medium-high heat. Dry fish with paper towels and dip in prepared batter, which should now be very bubbly and light. 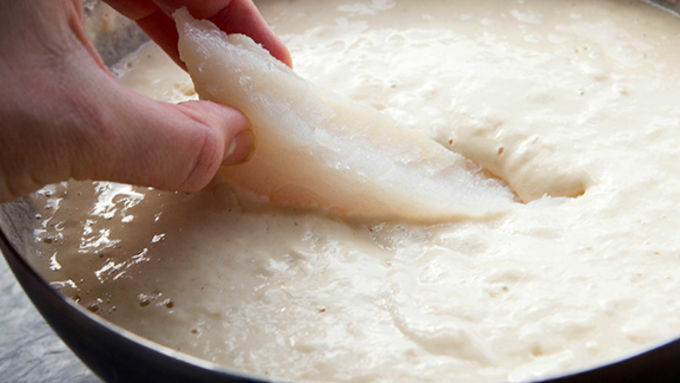 Transfer battered fish to hot oil and fry until golden brown on both sides, making sure the oil is just hot enough to brown the batter and cook the fish all the way through. TIP: Cook a test strip of fish first before frying the entire batch, just to make sure you've got the temperature right! 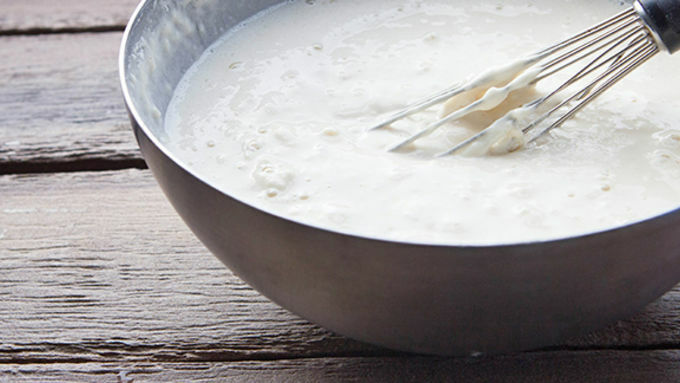 In small bowl, stir together the dip ingredients. Add sour cream, mayonnaise, lemon juice, roasted red pepper, dill pickle, and sriracha together. Stir until smooth. Serve fish and chips immediately with dip on the side. Enjoy immediately! 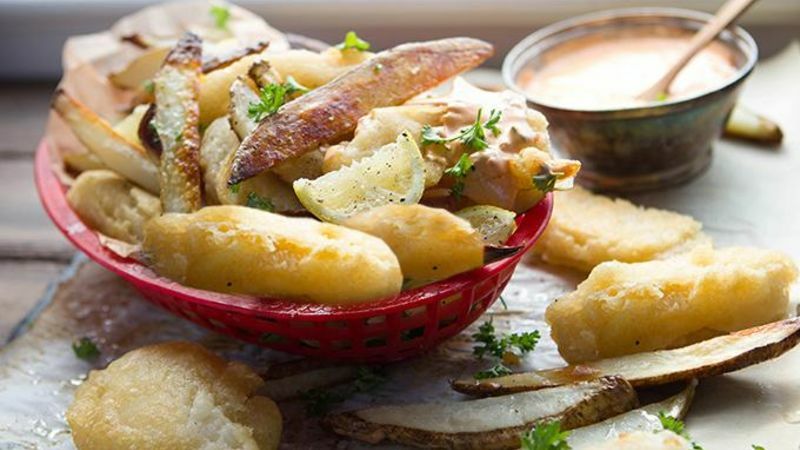 We'll show you how to batter and fry your way to this easy fish and chips dinner. Somewhere between today and three years ago, I turned into a lazy cook. I used to spend all day planning menus, shopping for ingredients, manicuring perfect meals for 5 o’clock. Nowadays, I forget to check the clock until 6, then frantically hunt down a 3-ingredient recipe that my kids won’t scoff over. It’s not that I’m doing less. Indeed, I’m doing a lot more now. Which leaves me thinking I’m not the only one that snubs any recipe with an ingredient list of more than a few items. We’re all so busy. We’re bringing in dough, doing laundry, raking yards, entering marathons, drinking 8 glasses of water, cheering at soccer games and hitting the pub once a week with dear friends. There’s not enough time to fit all of the should-do’s in, so we’re left running crazy, cutting shopping lists, and forgetting to cook food that rocks. But this recipe is going to change everything. Because it’s eassssssy. Sure, the ingredient list is longer than the Declaration of Independence, but it’s all stuff you already buy, and the actual putting together of the ingredients is as hard as stirring everything in a bowl. Frying fish over a hot stove? You can do that. And you’re gonna be glad you did it. Because, holy mackerel. This beer-battered fish is the real thing. It’ll revive your belief in food you make at home. It’ll swim into your face and make your gut glad to be alive. And, it’ll cook up with such golden, puffy goodness, you’ll wanna quit your job and take up professional eating for, like, ever. Let’s do this thang. Did you know beer batter is pretty much flour, baking powder, a few tiny little spices, and beer? Duuuude. This is a revelation. You’ve been spending $12 buying a plate of this stuff at the restaurant down the street. You can make enough to feed four for less than $6. If you’re having a hard time frying your fish and keeping several batches hot, feel free to pop the fish into the oven while your chips bake for 10-15 minutes. That’ll keep it hot, and the batter crispy. Now comes the fun part. Pile everything in a heap and serve immediately. You want it all piping hot. Serve with sauce. Sit back and enjoy. Life be lovely.